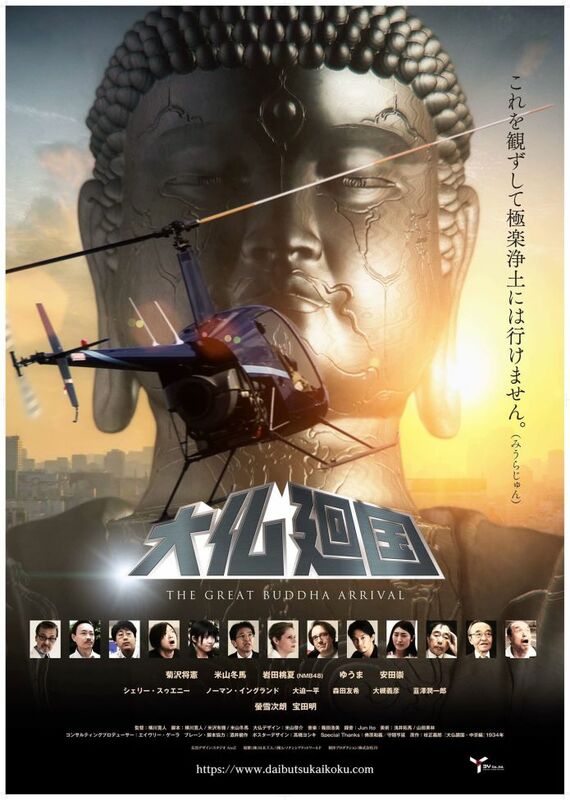 "THE GREAT BUDDHA ARRIVAL" !! Legendary Godzilla series star Akira Takarada joined our cast! Beloved Godzilla series star Shelley Sweeney joined our cast! Godzilla fan favorite Robert Scott Field joined our cast! Gamera acting legend Yukijiro Hotaru joined our cast! Now, I have you up-to-date on all of that, I found long lost kaiju actress PEGGY NEAL! I even got her to agree to suit-up and take on a role! I'm currently running a KickStarer to get her to our set in Japan to return to the big screen! We really will need your help to make this happen so PLEASE take a peep at our fundraiser and if you can pitch in to earn yourself some cool perks like autographed pics and such! Last edited by AVERY GUERRA on Thu Jun 07, 2018 8:02 pm, edited 1 time in total. Re: "THE GREAT BUDDHA ARRIVAL" !! AVERY GUERRA wrote: Now, I have you up-to-date on all of that, I found long lost kaiju actress PEGGY NEAL! I even got her to agree to suit-up and take on a role! I'm currently running a KickStarer to get her to our set in Japan to return to the big screen! We really will need your help to make this happen so PLEASE take a peep at our fundraiser and if you can pitch in to earn yourself some cool perks like autographed pics and such! Cool! Although, with Kickstarter, it is only letting us donate one time. If one wishes to pledge again, and say without a reward, the option is not there. One can only change it through "Manage your pledge" to either increase or decrease the pledge, or canceling it all together. Perhaps I will have to sign in on a different account. Hopefully, this will come to fruition! We're now taking donations as little as just $1.00!! Now everyone can afford to help kaiju queen Peggy make her comeback and be in our new all-star kaiju film! Norman England joins our cast! Godzilla(2014) actress Yuki Morita has now joined our cast! 2 actors from Shin Godzilla (2016) have joined our cast! Ippei Ohsako and Inge Murata! Just launched is our new campaign to raise the final funds for us to secure a few surprise kaiju film stars for our film THE GREAT BUDDHA ARRIVAL including Peggy Neal and others! Please check out our fundraiser and if possible chip in so we can make this dream a reality. We've got some great perks to give you too! We're very excited to welcome aboard popular character actor Philip Granger (Tucker And Dale vs Evil, Monster Trucks, Ghost Wars) to the cast of our all-star kaiju film THE GREAT BUDDHA ARRIVAL!! Check out the Exclusive news at Rue-Morgue!! Please check out our campaign and consider donating to help us snag the last few celebrities for our all-star kaiju film as time is running out! Donations start as little as $5! Get your name in the film's credits as a 'Special Thanks' for just $30 or as an 'Associate Producer' for just $250!! Man, this thing is so close to its funding goal!!! Last couple of hours for a final push! WOW, with only $95 dollars to go, I think this may happen! Guys, let's help get this kaiju feature come to fruition! Done and done! Congrats to the production team. After 50 years, Peggy Neal makes her return to the genre! Looks interesting. Keep us posted. Akira Kubo, along with Akira Takarada, are my absolute favorites from the Showa era, and Mr. Kubo in particular, because we saw how he was able to play all sorts of types from the nerdy Tetsuo in "Monster Zero", to the heroic Katsuo in "Destroy All Monsters" and characters who had issues and vulnerabilities such as we saw in "Gorath" and "Matango". Great to see him return to the genre! A new promotional teaser trailer celebrating the casting of Akira Kubo as well as our fantastic soundtrack musicians has just dropped! Upcoming screenings in France and Germany are displayed as well as Peggy Neal, Toshi Toda, Ippei Ohsako, Shelley Sweeney and Akira Takarada can be seen! Yet another Shows Era legend has joined our cast! All "Kenny" jokes aside this one of one of my all-time favorites!